KANE'OHE BAY, Hawaii -- Stories about whales being towed out to sea aren't really front page material. 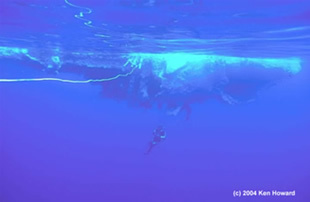 In fact, when I ran across a story in mid-May about a whale being towed out to sea from Hawaii's Kane'ohe Bay, I didn't think it merited a mention in UnderwaterTimes.com. It's a marginal story, without any possible follow-up, so I didn't run with it. As it turned out, there was no story to follow-up until now. 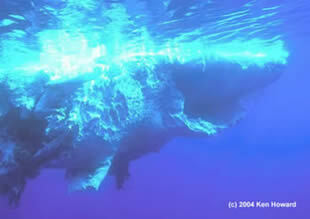 A couple days ago, Ken Howard, a professional underwater photographer, dropped me a note saying he had some amazing pictures of sharks feeding off a dead sperm whale carcass. That got me thinking�yeah, I remember a story about a whale carcass being towed out to sea. Hmmm�yeah, sounds interesting. "I spent a couple of extra days in Oahu on my way home, going out on a shark trip with Hawaii Shark Encounters at Haleiwa on the northwest shore. Some of their guests had not even used a mask and snorkel before. The guy driving the boat was Capt. Jimmy Hall. I tried the cage thing, but it was bouncing, and the Plexiglas reflected parts of the cage back into the image. Discouraged, I got out. I'd talked to Capt. Jimmy before we went out, so he knew I was experienced with sharks, and he invited me to go swim with them! I hadn't even brought fins out with me. No problem�Jimmy gave me his fins and a weight belt. I was able to get some decent shots of people in the cage, and of the sandbar sharks that came in very close for the chum they were throwing out. So we drop the tourists off, and Jimmy invites me to go look with him and a few friends for a sperm whale carcass that had been towed off the beach on Monday (May 17th) 35 miles out to sea (this was on Tuesday). Some fishermen had given him an approximate GPS reading. We go out and Jimmy finds it immediately, with a bunch of tiger sharks feeding on it. 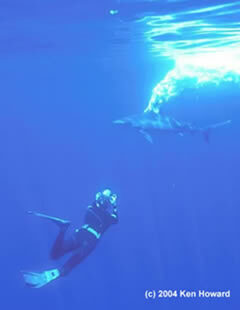 Naturally, after a few surface shots we go in and snorkel with them. 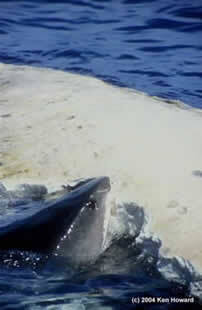 Jimmy tied the boat up on one of the exposed ribs of the sperm whale carcass. The tiger sharks did not seem to pose a threat, as they had been gorging on the carcass for some time. Actually, if they'd been hungrier, they might have stayed around a while longer�most took off shortly after we went in the water. On Wednesday I went back out with the operation, and a tiger showed up while I was snorkeling outside the cage�Jimmy immediately jumped in for some video�quite a thrill for the tourists in the cage! We then went back out after dropping off the tourists and found the carcass again, also with tiger sharks feeding, so I got some more images. The sharks left almost immediately, however�they must have been really full at that point! So kudos to Capt. 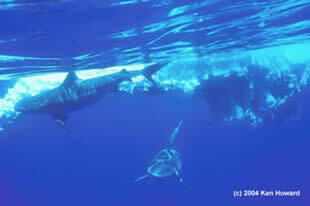 Jimmy Hall of Hawaii Shark Encounters for making my three-day tourist stopover in Oahu a memorable one! Keep in mind, I'm a full-time underwater photographer, and for good business and insurance reasons, normal clients are NOT allowed outside the cage, and certainly not allowed on the aforementioned tiger shark excursion." If you're interested in seeing more of Ken Howard's work, please check out his web site, Sea Images.org.